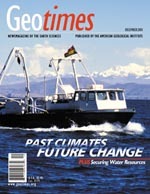 The December Geotimes features stories on the geosciences and climate change. Researchers are drilling sediments in Lake Titicaca to understand South America's climate changes on short timescales. Just how far back does the geologic record take us in understanding Earth’s past climate? And, link to a bibliography of articles that demonstrate recent advances in climate proxies and how these geological tools are helping us understand Earth's past climate. 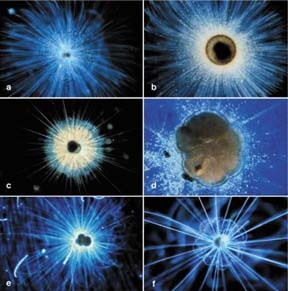 The more we learn about Earth's past climate, the more complex the picture becomes. A new Congressional Science Fellow recounts coming to the Hill in the wake of Sept. 11. Bolstering water supplies against terrorism. ON THE COVER: The USGS Neecho cruises on Lake Titicaca high in the Andes with the Cordillera Real in the background. The vessel is equipped with a drill core that will sample the lake's sediments for clues to past climate. Photo supplied courtesy of Paul Baker, Duke University. Read story here.